Who invented Frozen Food? The long lasting properties and endurance of Frozen Food was discovered by accident in prehistoric times thousands of years ago when Stone Age man stored food in caves which became frozen with the cold. However the name of the person credited with inventing quick freezing method to produce modern Frozen Food is Clarence Birdseye (1886 - 1956). When was modern Frozen Food invented? Clarence Birdseye invented his quick freezing method for Frozen Food in 1922, during the Interwar period of invention (1918 - 1939). Definition of Frozen Food: Modern Frozen Food is defined as a food preservation process by which food is subjected to rapid freezing and is kept frozen in a freezer until required. Fact 1: Who invented Frozen Food? The quick freezing method for producing Frozen Food was invented by Clarence Birdseye in 1922 during the Interwar Era of inventions (1918 - 1939). Fact 2: Who invented Frozen Food? Prior to the invention of quick freezing method for Frozen Food in 1922, conventional food preservation techniques such as drying (curing), fermentation, smoking, sugaring, pickling, salting, canning were used to store food for future consumption. Fact 3: Who invented Frozen Food? Traditional food preservation methods resulted in changes of taste, color, texture whereas freezing has little or no effect on the properties of food. Fact 4: Who invented Frozen Food? The durable properties of frozen food were discovered in prehistoric times when food was stored in caves and accidentally frozen. However the ability to freeze food without spoiling it was not controlled by man, it was dependent on the weather or on natural resources such as ice. Fact 5: Who invented Frozen Food? The invention of Ice Cream was made c. 200 BC in Ancient China using a mixture of flour, camphor, water buffalo milk and ice. It was an extremely expensive process and slaves were sent into the mountains to collect snow and ice and quickly transport it back to the ice cellars of the royal palaces so that ice cream could be made. The Chinese went on to experiment with a process to freeze ice cream using salt and saltpetre (nitre) to lower the freezing point of ice. Fact 6: Who invented Frozen Food? The Ancient Greeks and Romans also used natural ice to create fruit sorbets for extremely wealthy citizens and similar recipes were used during the Medieval and Renaissance to create cold deserts. Fact 7: Who invented Frozen Food? In 1626 the English philosopher and scientist Sir Francis Bacon (1561 - 1626) conducted various experiments on freezing measuring durability of food and rates of decay. He informed the King about his his findings on the ability to preserve raw meat through freezing and recommended the practical benefits of preserving food for warfare or famine. Sir Francis Bacon died of pneumonia after developing a chill during his snow and ice research. Fact 8: Who invented Frozen Food? In the 1700's Ice houses were built by the wealthy to store ice throughout the year. The Ice was laboriously chopped from a lake surface and dragged by sled to the ice houses. 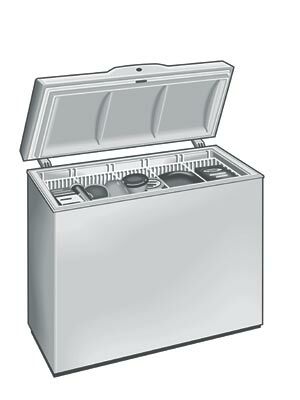 The days of ice harvesting also led to the invention of iceboxes in the early 1800's. Fact 9: Who invented Frozen Food? In 1861 Enoch Piper of Maine, United States patented a method of freezing whole fish using pans filled with salt and ice. In 1869 William Davis developed a method of filling metal boxes with fish before immersion in an ice and salt mixture. Fact 10: Who invented Frozen Food? The breakthrough that led to frozen food happened in the late 1800's during the Age of Electricity. In Bavaria beer "lagered" in caves packed with ice and in 1873 Carl von Linde (1842 - 1934) invented mechanical refrigeration for beer storage tanks and went on to invent the Refrigerator in 1876. Fact 11: Who invented Frozen Food? Mechanical refrigeration systems were used in combination with insulated rooms, fishing vessels and railroad cars for the storage of frozen food in the 1880's but there were many criticisms concerning the inferior quality of the food that was being frozen. Fact 12: Who invented Frozen Food? The inferior quality of the frozen food led Clarence Birdseye to undertake research into the freezing process and storage of frozen foods and the invention of his quick freezing method in 1922. Fact 13: Who invented Frozen Food? The inventor of quick freezing method for Frozen Food, Clarence Birdseye, was born on December 9, 1886 in Brooklyn, New York City, United States and died on October 7, 1956. Fact 14: Who invented Frozen Food? The early years of Clarence Birdseye were spent in Brooklyn, New York City, United States where he was raised by his family. Clarence Birdseye was educated at Amherst College and studied biology but had to drop out in 1910 due to lack of funds. Fact 15: Who invented Frozen Food? His first job was a government field naturalist for the U.S. Biological Survey. Clarence Birdseye supplemented his meagre income with fur trading and 1912 embarked on a 5 year fur-trading expedition on the Canadian peninsula of Labrador. Fact 16: Who invented Frozen Food? During the expedition he watched the native Eskimos freeze food in the winter using ice, wind and cold temperatures to freeze freshly caught fish instantly. The frozen fish was delicious and Clarence Birdseye realized that the speed of freezing the fish resulted in the retention of its freshness until the fish was thawed. Fact 17: Who invented Frozen Food? When Clarence Birdseye returned home he began to work on a quick freezing method that would successfully freeze not only fish but also meat, fruits and vegetables. Fact 18: Who invented Frozen Food? Clarence Birdseye's research resulted in several key observations and developments. Tests proved that the method of quick freezing prevented the loss of quality in many foods and the importance of maintaining a uniform temperature of -12º centigrade or below during the storage of frozen food. Fact 19: Who invented Frozen Food? Clarence Birdseye’s first freezer was completed in 1924 and founded his frozen-food company, the General Seafood Corporation. He then went to work freezing his first product which were haddock fillets. Fact 20: Who invented Frozen Food? Clarence Birdseye went on to design convenient, easy-to-store packaging for retail markets and used his divided name as his brand creating the Birds Eye label. Fact 21: Who invented Frozen Food? Clarence Birdseye invented double and multiple-plate freezing systems to achieve rapid freezing of foods in packaging for which he was granted 3 patents. Fact 22: Who invented Frozen Food? The Postum Company bought the General Seafood Corporation in 1929 renaming the company General Foods Corporation. General Foods kept the Birds Eye trademark. Clarence Birdseye appointed as a consultant and as president of Birds Eye Frosted Foods and Birdseye Electric Company until 1938. Fact 23: Who invented Frozen Food? Clarence Birdseye went on to create many other inventions and held over 300 patents when he died on October 7, 1956. Fact 24: Who invented Modern Frozen Food? The invention of modern frozen food revolutionized the way we eat. Refrigerators and Freezers became more affordable and the invention of the Microwave Oven allowed people to quickly prepare frozen foods at home. Who Invented Frozen Food - Clarence Birdseye - Inventor - Invention - Definition - Meaning - Famous - Important - Frozen - History - Timeline - Innovation - Significant - Development - Food and Drink - First - Definition - Kids - Facts - Information - Info - Dates - When - Why - Impact - Purpose - Use - New - Old - Frozen - Amazing - Best - Definition - Meaning - Awesome - Cool - Interwar (1918 - 1939) - American - History - Timeline - Who invented Frozen Food?